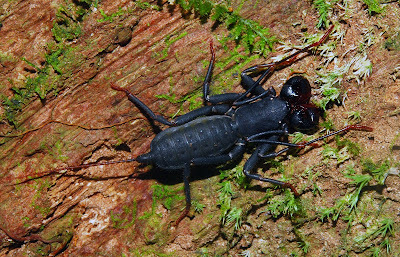 Thelyphonus sp., copyright Arthur Anker. The Thelyphoninae is a group of whipscorpions found in south-east Asia and Melanesia (Rowland & Cooke 1973). Characters (from Rowland & Cooke 1973): Tarsal segments of first leg of female usually modified (except in Minbosius manilanus and Abaliella rohdei), variously incrassate or apophysate; pedipalpal patellar apophysis of male unmodified, occasionally longer than in female; abdominal sternites II and III modified; two, four or no ommatoids present; keel present between lateral and median eyes; posterior abdominal tergites divided. [RC73] Rowland, J. M., & J. A. L. Cooke. 1973. Systematics of the arachnid order Uropygida (=Thelyphonida). Journal of Arachnology 1: 55–71. [T89] Thorell, T. 1889. Viaggio di Leonardo Fea in Birmania e regioni vicine. XXI.—Aracnidi Artrogastri Birmani raccolti da L. Fea nel 1885–1887. Annali del Museo Civico di Storia Naturale di Genova, Serie 2a 7: 521–729.